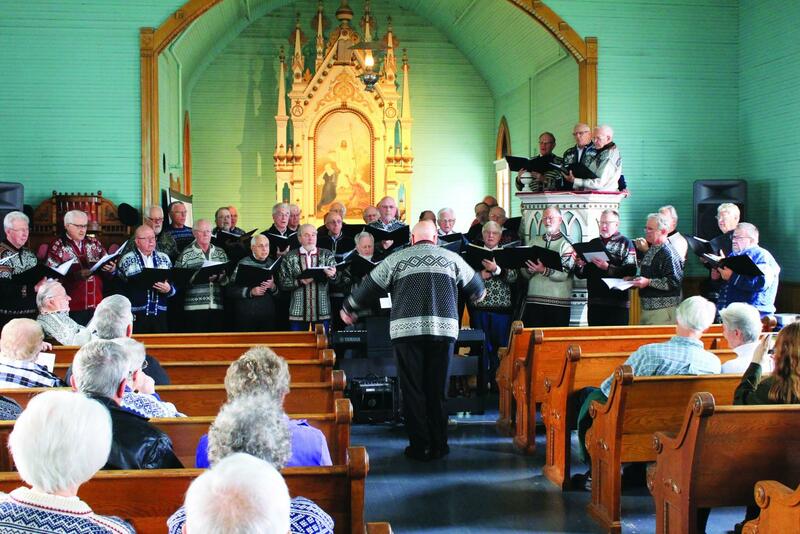 Luren Singing Society performs in the Bethania sanctuary downtown. Julenisse’s coming to town! 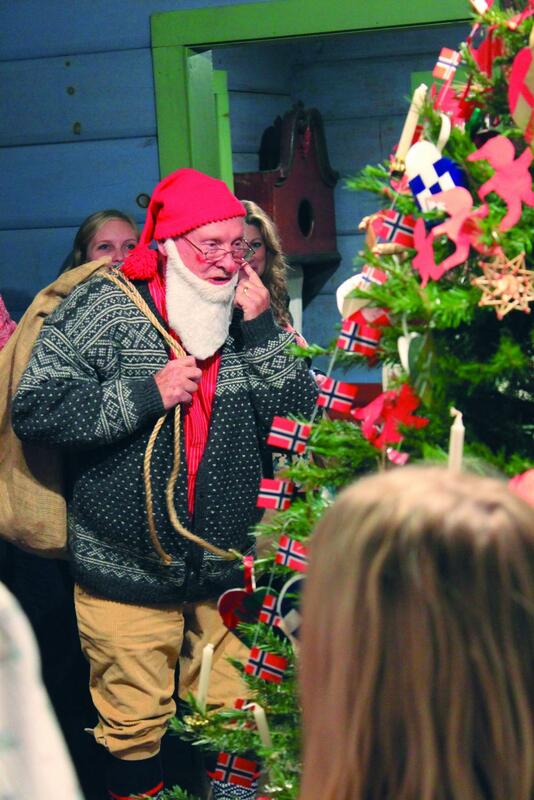 The Vesterheim Norwegian American Museum and Heritage center, more commonly known as Vesterheim, held their annual Norwegian Christmas celebration in downtown Decorah Saturday, Dec. 2 from 10 to 4. Attendees were treated to live music and traditional Norwegian Christmas foods, as well as book signings, crafts, and Juletrefest. Juletrefest translates to traditional Christmas tree dancing. The celebration allowed the community to participate in Norwegian Christmas traditions. Some of the traditional dishes served were Varme Pølse, which is a thin pancake-wrapped sausage, and rømmegrøt cream custard. A variety of cookies were sold a la carte in the basement of Bethania Church — an old Norwegian Lutheran church located across the street from the Vesterheim as a part of their open air exhibit. In the Bethania sanctuary and the upper floor of the museum building, live music was performed by community ensembles including the Decorah Chorale, Luren Singing Society, and Touch of Brass quintet. The ensembles shared a variety of Christmas carols and hymns, some of which were sung in Norwegian. Julenissen, a Norwegian Santa-like folklore figure, carries a bag of gifts for children. In addition to the classic foods, Vesterheim staff members demonstrated traditional Norwegian crafts. This included wood carving, wheat weaving, and Rosemåling — a form of traditional Norwegian wood painting. Around the museum, both children and adults were invited to make paper ornaments to decorate their own Juletre, an important aspect of the Norwegian Christmas tradition. Children were invited to participate in Juletrefest, where they were joined by museum volunteers and the Julenisse. Julenisse is a Santa-like Norwegian folklore figure who visits families on Christmas Eve, leaving presents for good little children and rocks for the poorly behaved children. Together they sang Christmas hymns in Norwegian and English and danced circles around the tree. Traditional Norwegian desserts displayed with a translated menu. As a part of the celebration, Vesterheim arranges additional exhibits and activities. 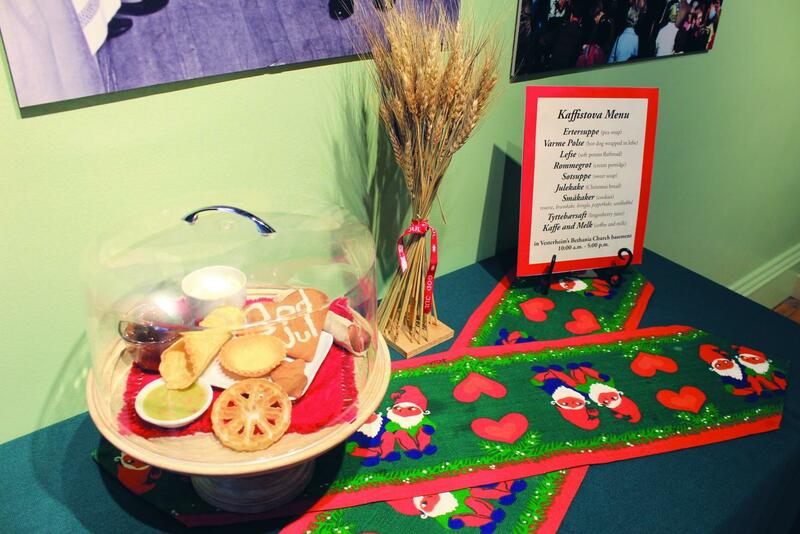 Some are Christmas-themed, while others are simply extensions of the museum’s mission statement which says “[embody] the living heritage of Norwegian Immigrants to America.” This year they welcomed attendees into a recently-opened exhibit titled “Koselig,” which celebrates the Scandinavian values of comfort and togetherness. Throughout the year, the museum hosts a number of other events including Takkefest and Syttende Mai. This is all intended to keep the city of Decorah close to its roots, according to Griesheimer. The Vesterheim Museum is the largest American museum dedicated to a single ethnic group, and it traces its roots back to Luther College. As a result, the college and museum maintain a close relationship. “We are here to celebrate and embody the heritage of Norwegian Americans that have come here through time and to help everyone appreciate tradition,” Griesheimer said.